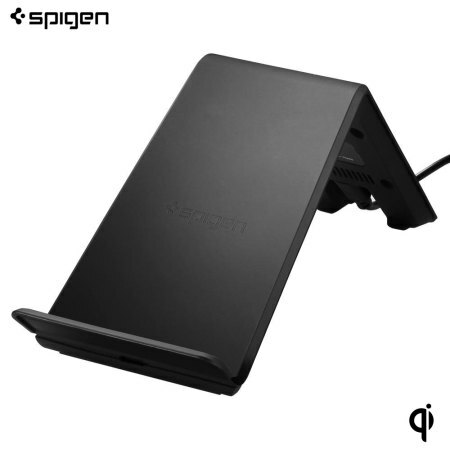 Charge your Qi compatible device wirelessly with the versatile F303W Charging Stand from Spigen. Convenient, stylish and well crafted, the F303W features dual coil technology for increased range and efficiency. Easy to use, looks great on the desk and works really well. The delivery was fine but the item are bigger then I thought, however, it does charge fast. Love this wireless charger so much I bought 2! High quality product delivered next day. The fast charger IS clearly faster in wireless charging for my iPhone X, and does seem to be at least 50% faster (7.5 watts vs. 5 watts). The only issue, which I've found with other wireless chargers for the iPhone X, is that if you put the phone in the charger and then turn the phone off, it turns back on automatically - no way to charge the phone in the "off" mode, unless you put it in "airplane" mode (a minor issue). Love this; very easy to use. Only flaw is that it doesn’t fold away, so traveling with it can be a pain. The charging stand works great. Having the phone at an angle is great and especially nice for FaceID on the iPhone X. One little quibble. The blue light on the base is quite bright--a little too bright for bedside use.because I like to sleep in a completely dark room. A tiny piece of electrical tape covers it so it's not an issue.